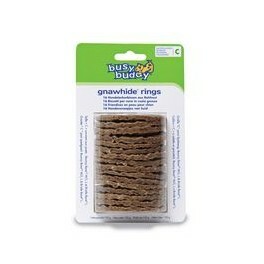 Busy Buddy Gnawhide Rings are delicious chew treats that are designed to fit Busy Buddy Bouncy Bone and Bristle Bone toys. Designed to fit the large Bouncy Bone and the large Bristle Bone. Last 10 times longer than rawhide treats when used with Bones. Includes 16 Large Gnawhide treat rings.